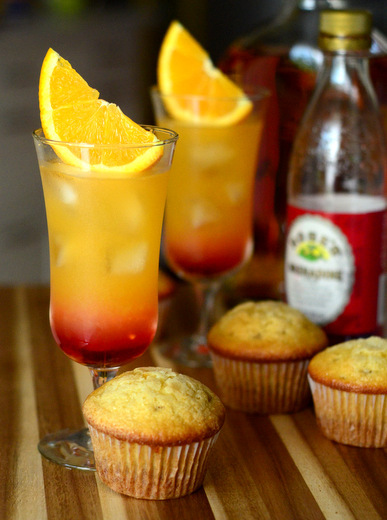 A Tequila Sunrise is a classic brunch cocktail and one of the most popular uses for tequila outside of a margarita. The cocktail is easy to make, with a combination of fresh orange juice, tequila and grenadine – with the grenadine playing a key part by adding both color and sweetness to the drink. 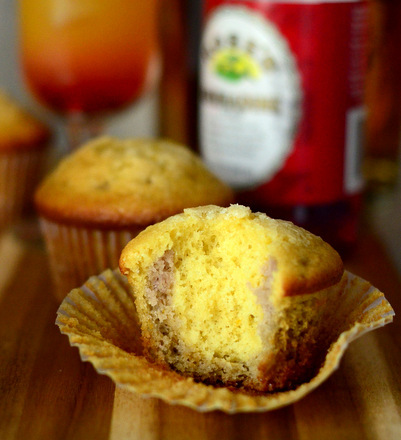 These Tequila Sunrise Muffins are inspired by the cocktail and use the same flavorings for some baked goodies that are sure to be a hit at your next Sunday brunch! The muffins start with a single dry ingredient mixture which is divided into two different parts: one orange batter and one cherry batter. Both batters are made with tequila (which will evaporate during baking, so you don’t have to worry about catching a buzz from a batch of these! ), but one portion of the batter has orange juice added to it, while the other portion has cherry juice and grenadine. Dividing the batters allows you to make a two tone cupcake that resembles the two tone cocktail, and it also allows you to clearly taste both the orange and cherry in each bite. Most grenadines (I used Rose’s) use plenty of red food coloring, I opted to skip additional food coloring in this batch. As you can see, this left my red layer a bit muted, though it still offered a nice contrast to the lighter orange batter. If you want a more vivid red color, add a bit of food coloring in with your cherry juice as you mix up the batter. 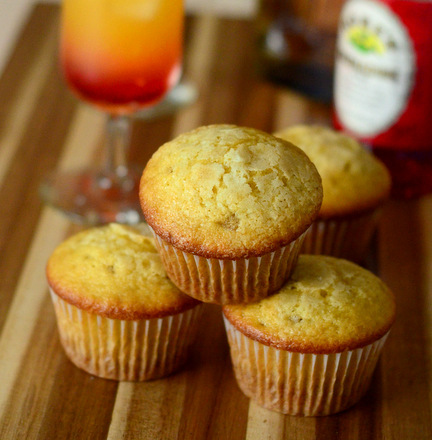 Like the cocktail that inspired them, these muffins are much better if you make them with freshly squeezed orange juice than bottled orange juice. This is, in part, because my recipe calls for fresh orange zest and skipping that would mean less orange flavor in your finished muffins. And if you’re serving these, you’ll probably want to make a batch of real Tequila Sunrise cocktails (recipe coming tomorrow, stay tuned!) 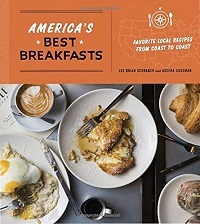 to go with them, so you’ll likely have fresh oranges in your kitchen anyway. I finished my muffins by adding a pinch of sugar to the top of each one just before baking. The sugar gives them a nice finished look and adds a hint of texture to the tops of the muffins. The muffins can be served slightly warm or at room temperature. They’ll also keep well for at least a day or two when stored in an airtight container, so you can bake them the night before you intend to serve them if you want to save a little time in the morning. In a large bowl, whisk together flour, sugar baking soda, baking powder and salt until well-combined. Remove one cup of the dry mixture to a smaller bowl. In a small measuring cup, whisk together egg, vegetable oil and orange zest very thoroughly. Pour 2 1/2 tbsp of the egg mixture into the small bowl of dry ingredients, along with 1 tbsp of tequila, 3 tbsp cherry juice and 1 tbsp grenadine. Add food coloring, if using. Whisk until completely combined. Pour the remaining egg mixture into the large bowl, along with remaining 2 tbsp tequila and orange juice. Whisk until completely combined. Divide cherry batter evenly between prepared muffin cups. Divide orange batter into prepared muffin cups on top of cherry batter. Bake for 14-16 minutes, or until a toothpick inserted into the center of the muffins comes out clean and the muffins spring back when lightly pressed. 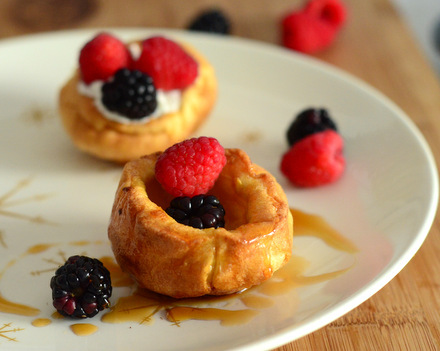 Turn muffins out onto a wire rack to cool completely.